Dust to Dust presents Ice Cream Social, an exhibition of functional and sculptural vessels, drawing, painting, and handmade ice cream. Ice Cream Social is part celebration of community and part utopian fantasy, expressed through works that explore the formal qualities of frozen dessert; become sites for play; use ice cream symbolically; and cast a critical eye toward some of the saccharine ideals that an Ice Cream Social might conjure. Ice Cream Social features work by Josh Bolin, Emily Counts, Brian Giniewski, Shaina Kastztelan, Erica Prince, Amy Santoferraro, and Jessie Rose Vala. 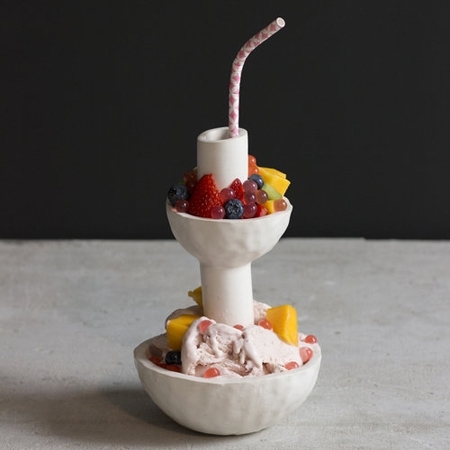 For the opening, Jared Goodman will debut a utopian, summer-inspired vegan ice-cream. Emily Counts, Jessie Rose Vala, and Amy Santoferraro were invited to create works in response to ice cream. Counts, whose mixed-media sculptures explore themes of fluidity and sexuality, extends her practice into functional pieces. Reminiscent of a female totem or anthropological venus figurines, Counts' sculptural dish is a fantastical interpretation of the theme. Vala’s sculptural vessel also draws on the myths that populate her mixed-media works. A dish sits atop a gold spotted animal head. A mysterious, inverted U, sits on the brow of the animal, adding to the ceremonial appearance. Santoferraro’s response to ice cream focuses on ice cream’s material properties. Rather than a dish, Santoferraro’s sculptures feature a lattice structure that holds the ice cream, allowing it to melt and drip into a reservoir below. Brian Giniewski’s Drippy Cups and Bowls are made in his Philadelphia studio. Classic shapes, made from colored ceramic are glazed using a signature technique that causes the brightly colored glaze to flow down the sides of the vessel like icing. Erica Prince utilizes a limited sculptural vocabulary to create interactive and utilitarian designs, bringing awareness to acts of choosing, placing, arranging, and compartmentalizing. Her multi-tiered ice cream dish embodies all of these aspects. 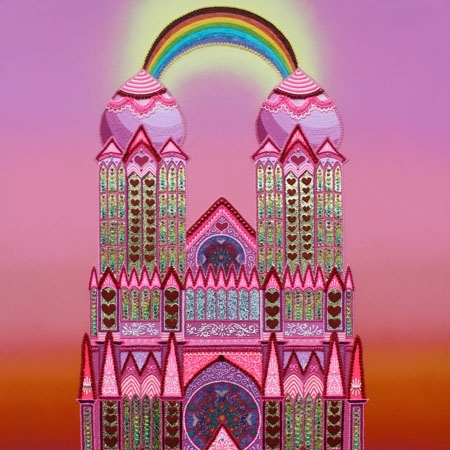 Shaina Kasztelan’s Kawaii Dream House (2018) is inspired by the cyber-fantasy home that Kasztelan obsessively built while playing The Sims. The house is decadently decorated, like a candy coated Gothic cathedral. The usual tracery, trefoil, and buttresses appear to be made of sugar rather than stone and the saints that would normally occupy the portals are replaced by cartoon hearts and the beatific face of Hello Kitty. For Kasztelan, the house is an expression of the societal pressure she felt to be feminine while identifying as a bisexual tomboy. Similarly, there are two sides to Josh Bolin’s ice cream inspired drawings. 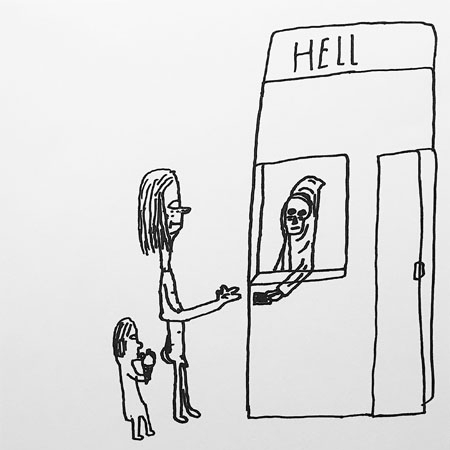 In one drawing, Bolin places a parent and child at the ticket booth of hell. The parent buys entry from a skeleton while the child licks an ice cream cone. The pair blandly enter hell as if it were a carnival ride. In another drawing, two anthropomorphic ice cream cones share a knowing glance pregnant with all the creepiness of animated food. Jared Goodman is a former high school social studies educator and food justice activist turned stay-at-home dad and conceptual ice cream artist. For Ice Cream Social, Goodman has created Rhubarb-strawberry-rose sorbet with spiced rhubarb ‘broth’ and pickled strawberries, a dessert inspired by veganism, utopia, seasonality, and the joy of sunshine and warmth. Goodman explains, “Seasonality is at the fore with rhubarb and strawberry, bright red and rising from the soil each Spring.” This vegan sorbet is not technically ice cream, excluding the cream to better reflect the utopian themes of the exhibition. “If utopia is the notion of a more perfect world… veganism is the practice of utopian idealism through food choice and consumption,” says Goodman.